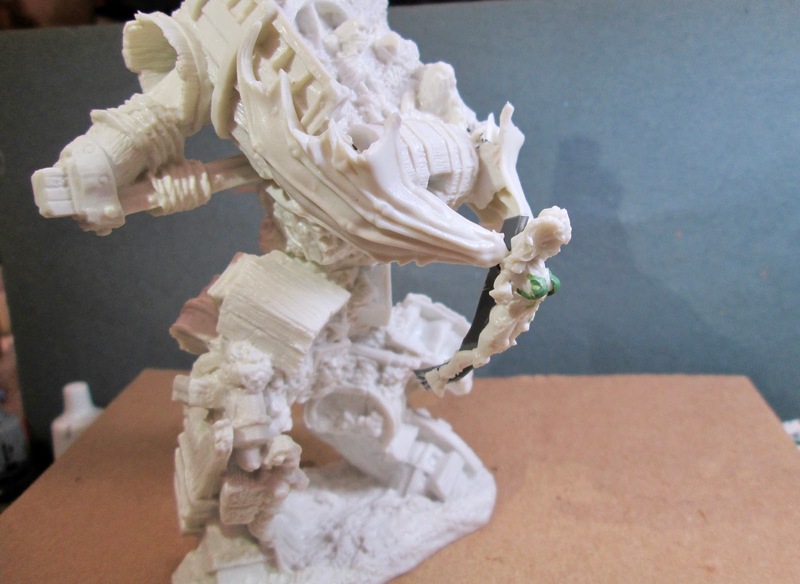 Bones 3 Shipwreck Revenant Conversion with Succubus Queen Figurehead Addition. | H.A.W.K.S. 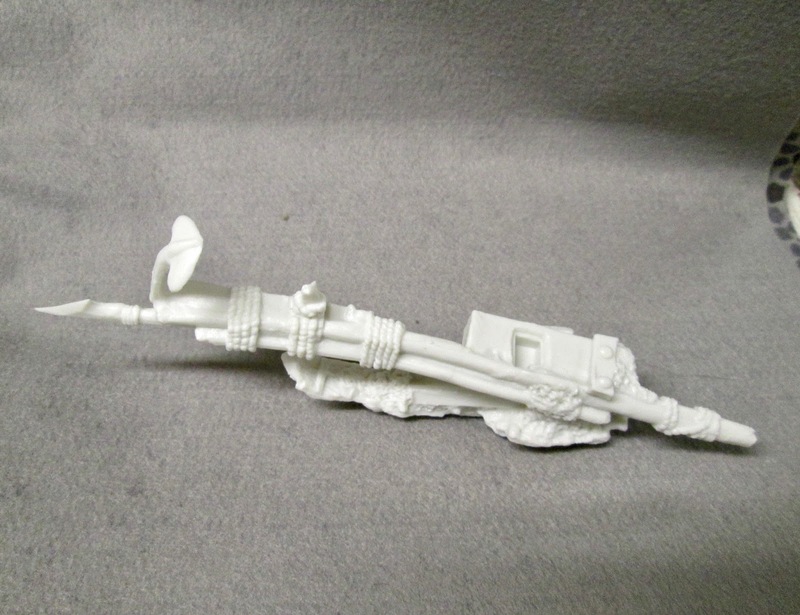 Bones 3 Shipwreck Revenant Conversion with Succubus Queen Figurehead Addition. 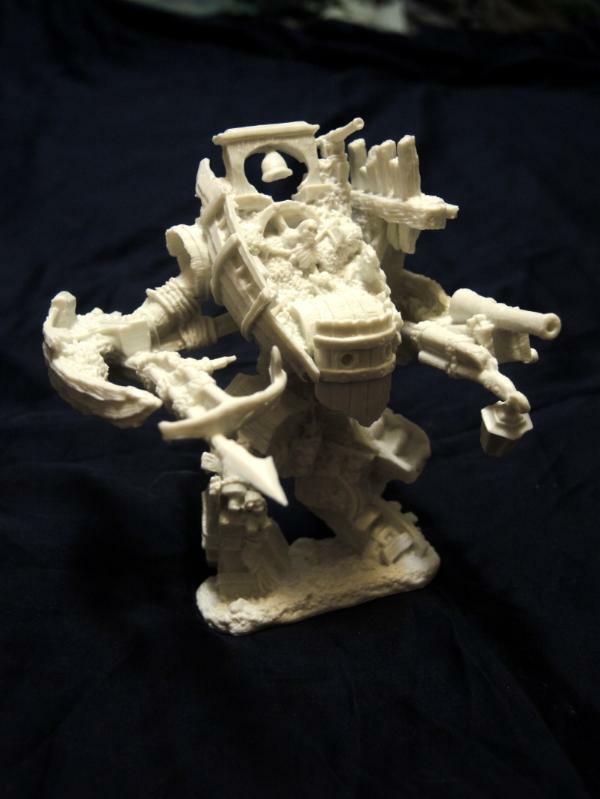 Over the past week I worked on doing a big conversion on the Bones 3 Shipwreck Revenant from the Titans of the Tide add-on set. 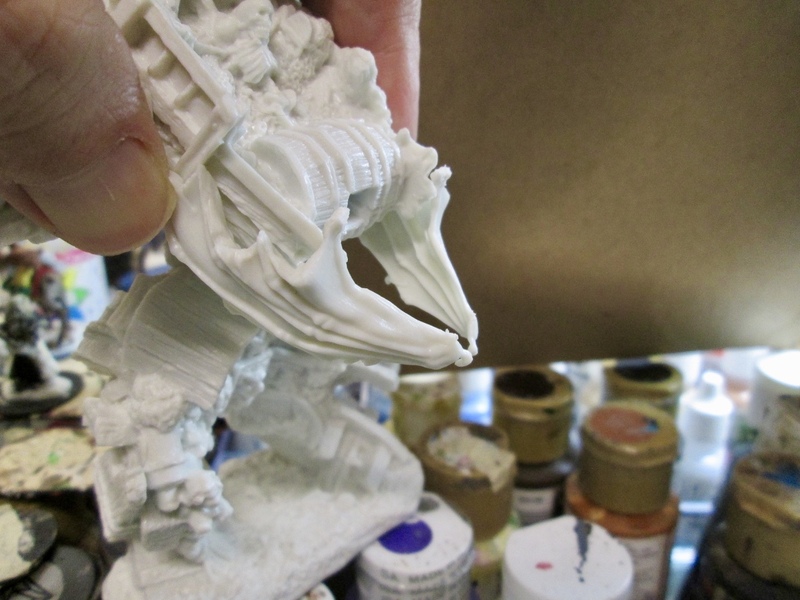 I was never thrilled with the “face” on the Shipwreck Revenant; it always looked a little contrived and dorky to me. 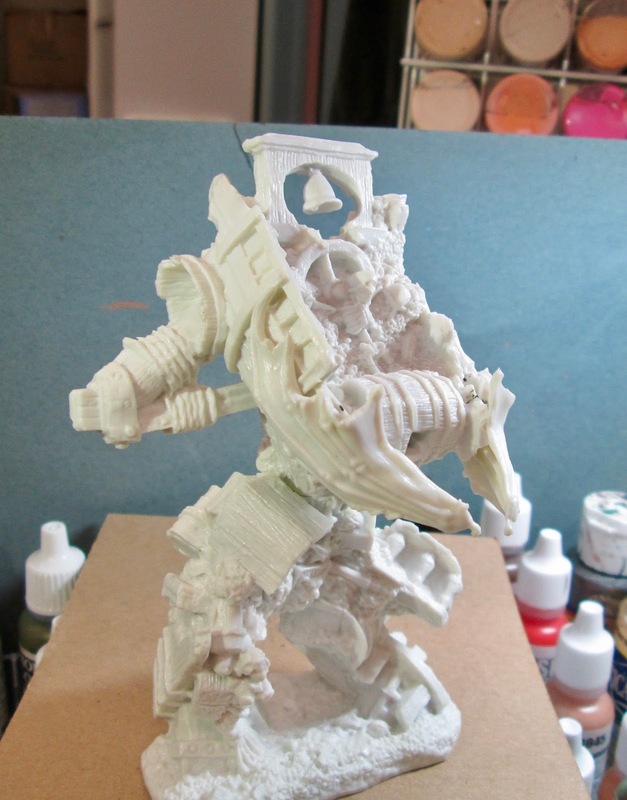 So when I got the model in the Bones 3 Kickstarter, I imediately began to think about how I would like to modify it. 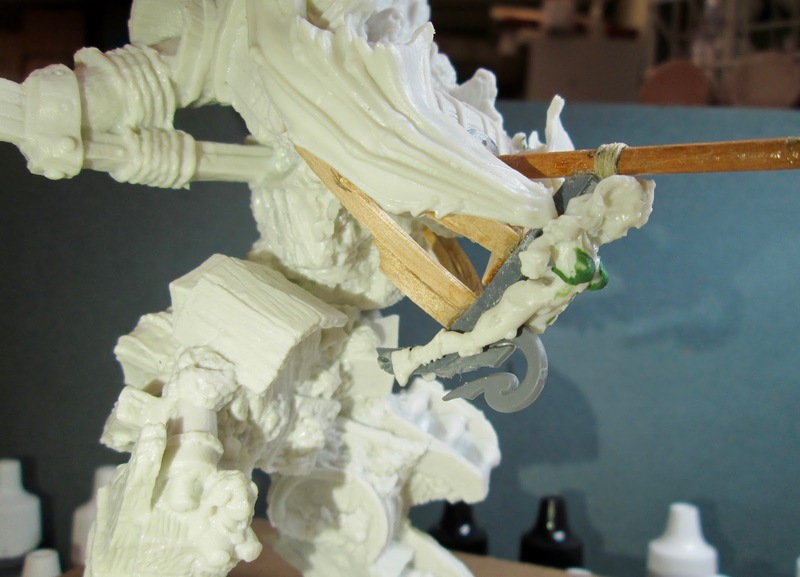 I forgot to take a picture of the model before I started working on it, so I snatched this shot off the web. It’s not a great shot, but gives you an idea of what the face of the piece was supposed to look like; it was just a bit of curved planking with two portholes in it. To me, I thought, it would have looked much better with some sort of menacing figurehead on the front. Then it struck me that Reaper’s Dark Maiden would be prefect for this. I tried mine out, and was amazed at how perfectly it fit on the front, and how good it looked. But before I shelled out the money to order a new Dark Maiden, I thought I’d dig through my Bones pile and see if anything would fill the bill. That’s when I hit on the Succubus Queen from the Bones 3 Stoneskull Expansion. She had a plain enough pose that she looked like she’d be a good candidate for a figurehead. And as I played around with bending her wings back, I realized if I flipped them over they closely mirrored the curve of the prow of a ship. 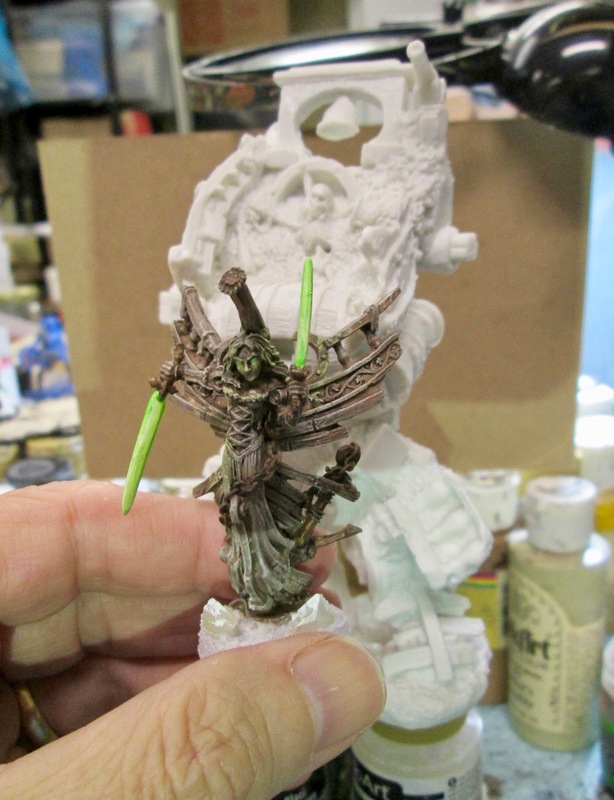 I thought her demonic appearance would help sell the evil feel of the Shipwreck Revenant as well. So the first thing I did was carefully pry the wings off the back of the figure, and test fit them on the prow. 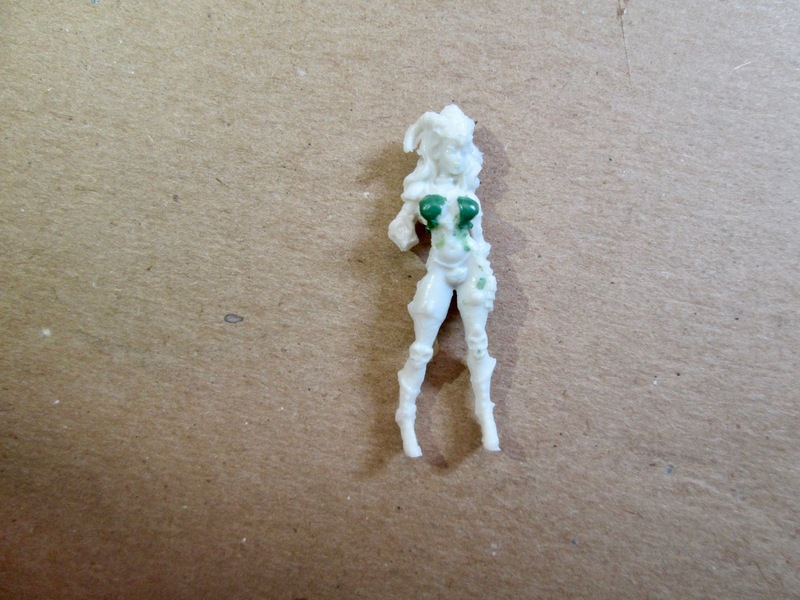 I then gave the Succubus Queen figure a quick and simple greenstuff top, so I could use the finished model in family friendly games. I also cut off her right hand so I could later affix one that would be holding a sword. 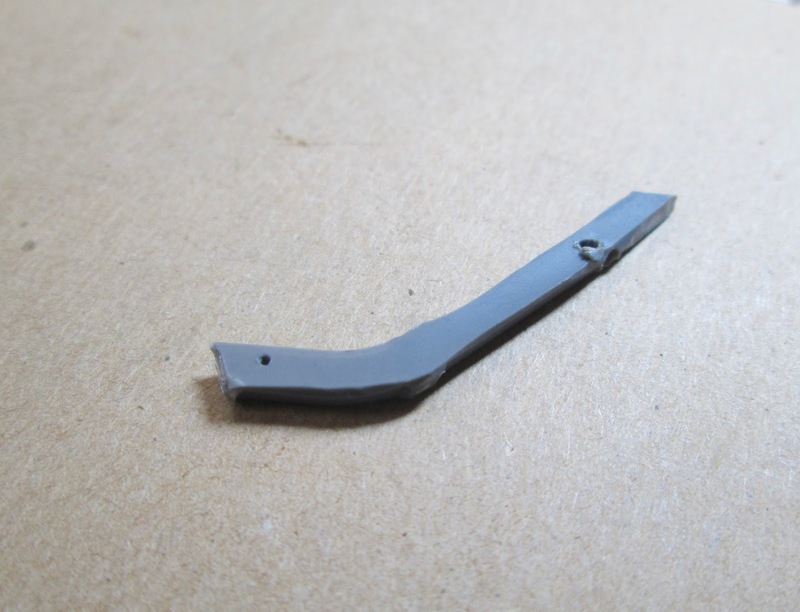 Next, I hunted through my plastic figure stash for a piece of sprue that had the right curve in it for me to use to make the front center beam of the prow of the ship. I then drilled some holes in it, because I knew I would have to pin the Succubus figure to it in order to get her to hang properly in the curved figurehead position. I then glued the wings to the front of the model. It took very little modification to get them to fit. I simply had to carve down some of the inner wing spines to help them lie more closely to the existing hull. 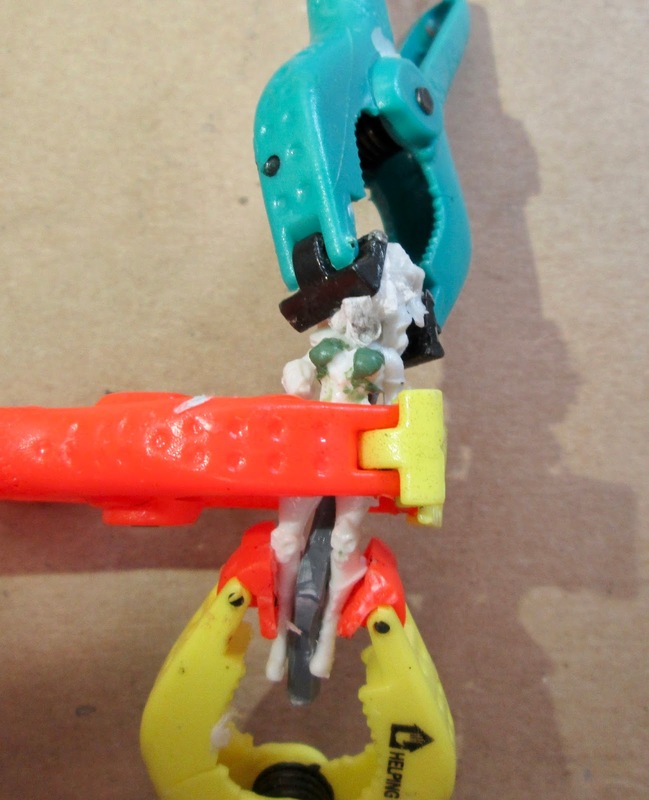 I then pinned the Succubus to the prow’s center beam and glued her with some superglue; clamping the figure to help hold it into position while the glue hardened. I then glued the assembly to the front of the ship by inserting the little tabs on the wings (which I trimmed down) into the slot in her back where the wings had originally been mounted. 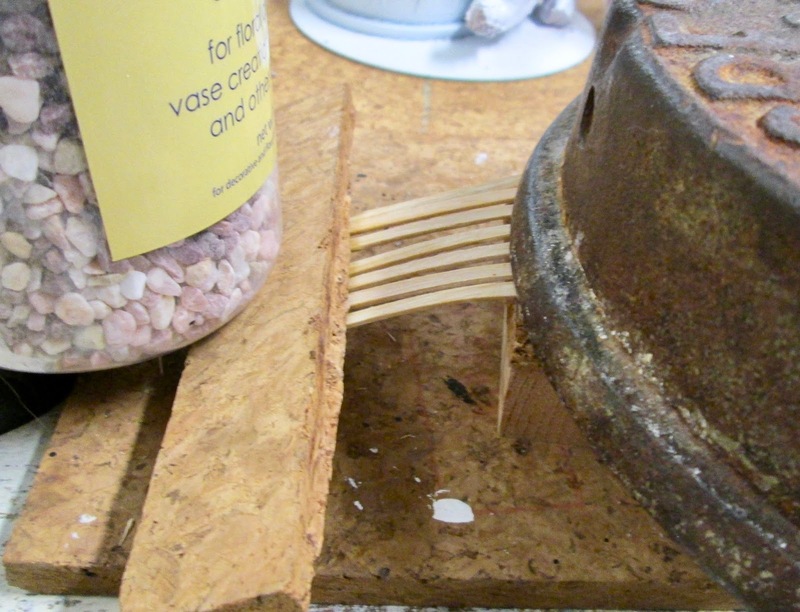 At this juncture, I cut some sections of coffee stirrers to make some planking for the prow; then after wetting them I set them under some weights to warp the wood into a curved shape suitable for constructing the ship’s prow. My next step was to construct a bowsprit to insert into the hole where the face had originally mounted. I glued it in place so it ran just over the top of the Succubus’ head. I also glued a bit of decorative shape cut from a GW Wood Elf banner to give the prow beam a touch of artistic scrollwork. I then glued my warped coffee stirrers into place, affixing one end of each plank under the wings, and the other end to the prow’s center beam. I didn’t attempt to rebuild the entire prow, just enough planks to help anchor the masthead, and give the impression of a rotted ships prow. 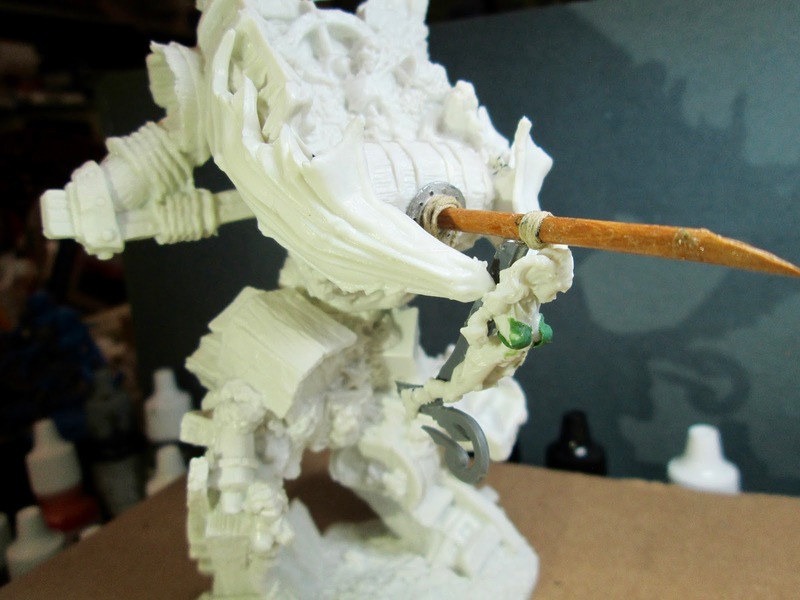 I finished off the prow by adding a sword-wielding hand to the figurehead. 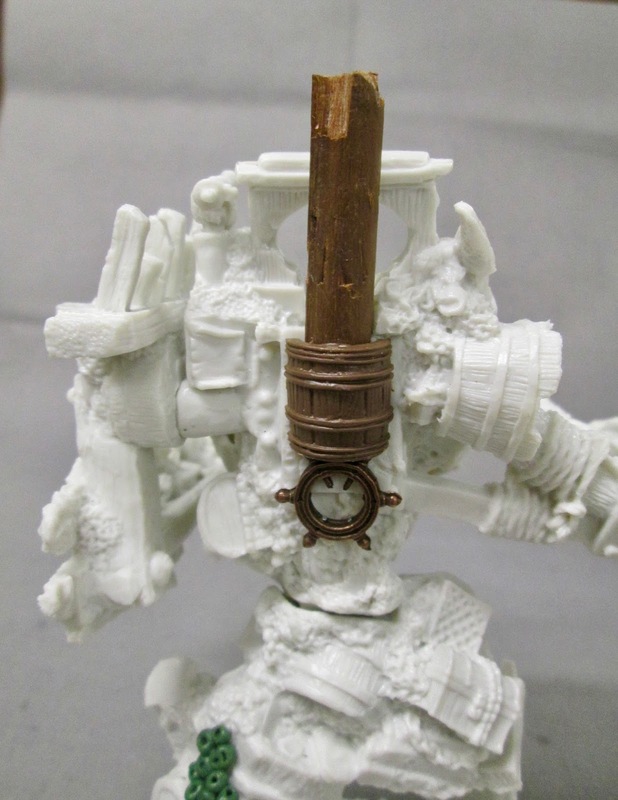 The second part of the Shipwreck Revenant that I really didn’t like was the silly tiki head on the back. I felt it didn’t really fit in with the shipwreck motif. So I sawed it off, and replaced it by a bit of dowel stuck in a half of a plastic barrel; with the idea it would look like a stump of broken mast. I also added an old broken ship’s wheel I had to help hide the lower area where the tiki head had been. 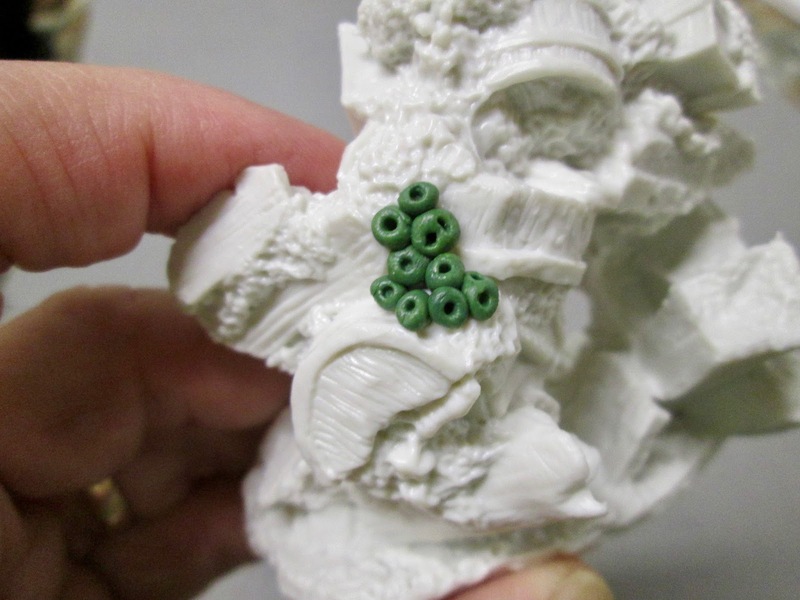 Another thing that I was not thrill with on this model was the shear abundance of coral. One of the ways I hoped to reduce this was to make it look like the skeleton “driver” was laying in a pile of treasure, and not coral. So I covered the coral around the skeleton with some white glue, and glued a bunch of glitter down to look like gold coins. 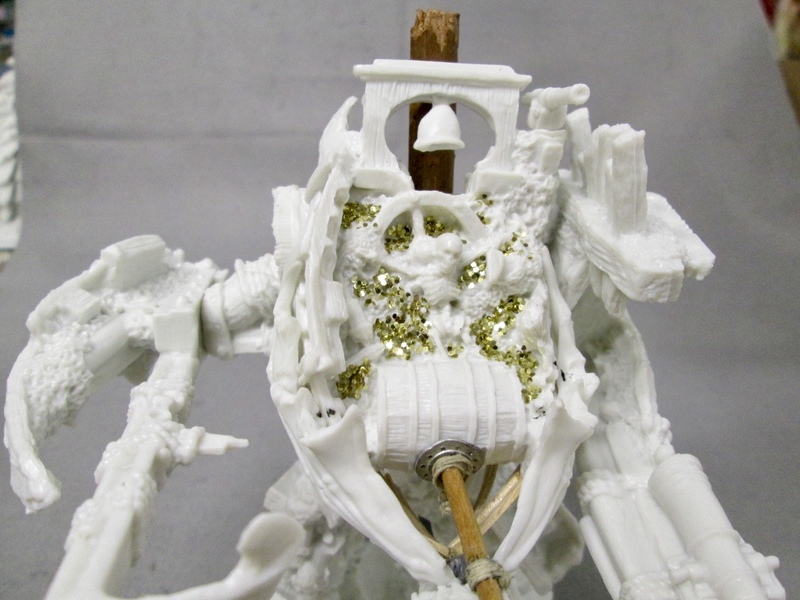 My plan was to paint over the glitter, as I was really only using it for its coin shape; it was mush too bright to look like old shipwrecked treasure in it’s natural state. Then, just for fun, I added a section of greenstuff barnacles to one leg to help cover a bit of coral. 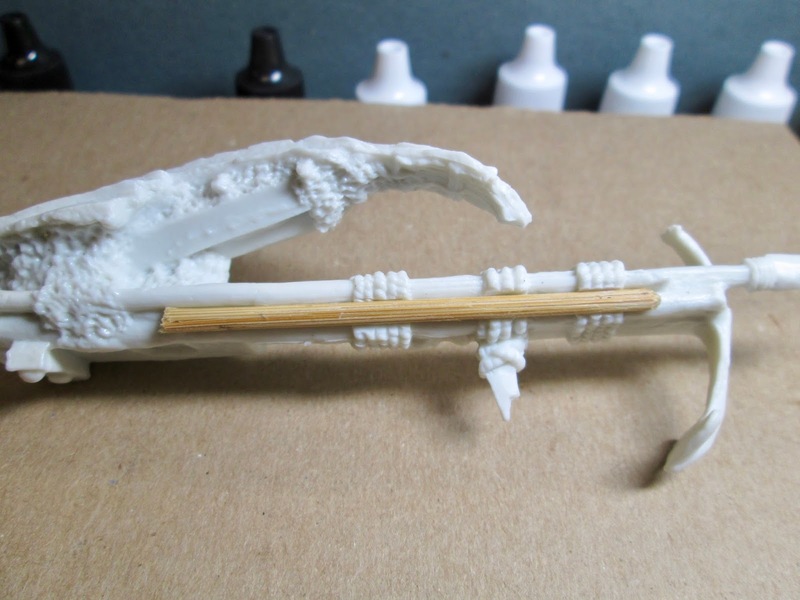 I thought I was finished at this point, but then I noticed that, just from gravity working on it as it hung attached to the side of the model, the harpoon arm had begun to bend downward. 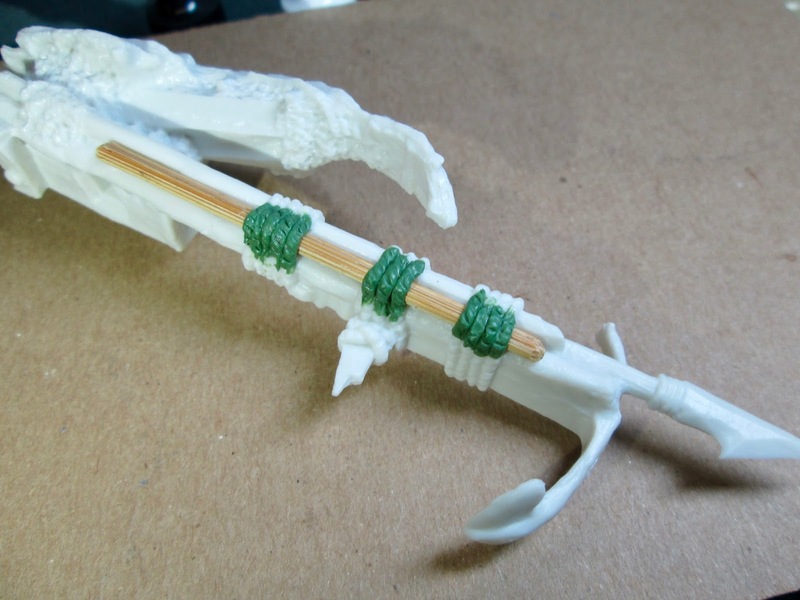 So, I cut way some sections of rope running along the underside and glued in a section of bamboo skewer. 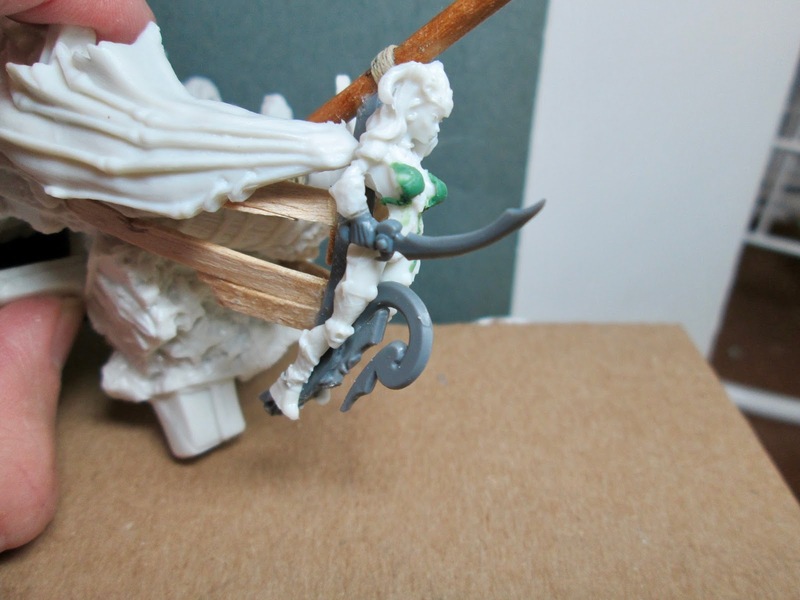 I then used some more greenstuff to re-sculpt the missing rope over the skewer addition. At this point I declared the model done. My next step is to prime it, and then begin painting it. I will be posting that article separately. I will try for Monday, but I can’t promise it will be done by then; so perhaps the Monday after that. Be sure to tune in for the exciting conclusion!